Strength - 12. Good strong coffee. 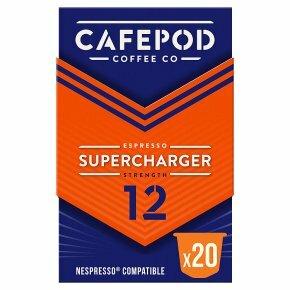 Fuel for your engine, Supercharger gives you that extra strong caffeine hit to help power up your day. Rich flavours are drawn out of the beans in the roast to create a super intense coffee with flavours of chocolate, caramel and nuts. Nespresso® compatible capsules Contents: 20 capsules containing freshly roasted and ground coffee.